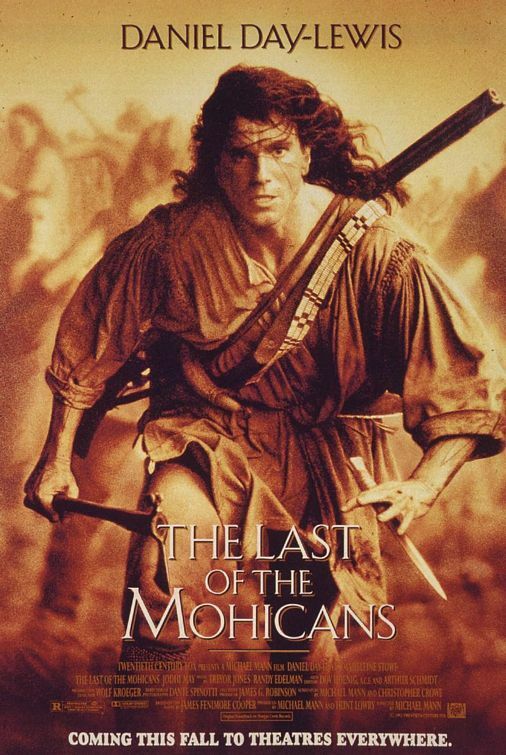 1992’s The Last of the Mohicans was the first Michael Mann movie I saw, introducing me to the world of the director’s stylized visuals. Today marks the film’s 25th anniversary and so we’re jumping in the Wayback Machine a bit early to revisit how this epic drama was sold to the public. Based on the classic novel by James Fenimore Cooper, Daniel Day-Lewis stars as Hawkeye/Nathaniel, a half-white man raised by a Mohican father in the years before U.S. independence. Hawkeyes and his family want no part of the French-Indian War currently raging. They’re pulled in, though, when they’re called on to protect Cora Munro (Madeleine Stowe), the daughter of a British colonel who’s been kidnapped by a scout the British army thought they could trust. So begins a passionate but chaste romance set against the lush landscapes of New York, featuring heightened emotions mixed with brutal violence. The theatrical poster captures many of those elements and emotions in a single image. Day-Lewis as Hawkeye is shown racing through what appears to be a massive melee, axe and knife drawn to confront whatever dangers lie before him. The determined look on his face show he’s clearly running *toward* something and feels very strongly about the matter. The actor’s name is the only one to appear at the top, showing the solid reputation he’d built up by this time. The washed out daguerreotype-esque look that’s applied to the photo achieves the same effect going full black-and-white would have, using a monochromatic approach to heighten the emotions on display. That’s a bit surprising given the movie itself would trade in such rich, lush green visuals. It’s also a bit of a surprise there’s no attention given to the romance that provides much of Hawkeye’s actions and which would have made a decent selling point. If the movie were coming out today it’s easy to see a design featuring Hawkeye standing with Cora wrapped in his arms and “I Will Find You” plastered across the top, selling it as a dimestore romance. There was a publicity still that shows just that kind of image. One has to wonder if it wasn’t the influence of Mann or someone else who nixed this approach. That romance forms the central focus of the trailer, though, which frames everything as being in service to the passion felt between Hawkeye and Cora. We see the violence that would be pervasive in the movie, as well as Hawkeye’s frequent clashes with the British army that doesn’t understand how anyone could possibly not be part of their formal structure. Hawkeye is positioned by the narrator as a courageous warrior devoted to honor and chivalry, while Cora is a woman ahead of her time, unwilling to fit into the societal box she was expected to and determined to strike her own path. The actual story arc isn’t super-clear here, but that’s not important. Between the heightened emotions and the incredible visuals, the trailer lays out exactly what the audience can expect to enjoy most about the movie. Mann’s eye for framing a shot and getting unique, powerful performances from his leads are all on display here and that’s what was going to hook the audience in 1992. These two elements of the marketing campaign emphasize a story that’s a far cry from the source novel, which has a much more staid tone and a much different ending. The emphasis on Day-Lewis makes a lot of sense following his Academy Award a couple years prior for My Left Foot. Overall it’s sold as a mainstream drama for discerning adults, neither a blockbuster nor an art-film but combining the best elements of both. Previous Picking Up the Spare: The LEGO Ninjago Movie, Brad’s Status, mother!